"Wonders of the Annamites" takes readers on a journey through one of the wildest and most biodiverse parts of the world—a range of mountains in Southeast Asia on the border of Laos and Vietnam known as the Annamites. Relatively unexplored until recent decades, the Annamite Mountains are now a hotspot for wildlife discoveries new to science. 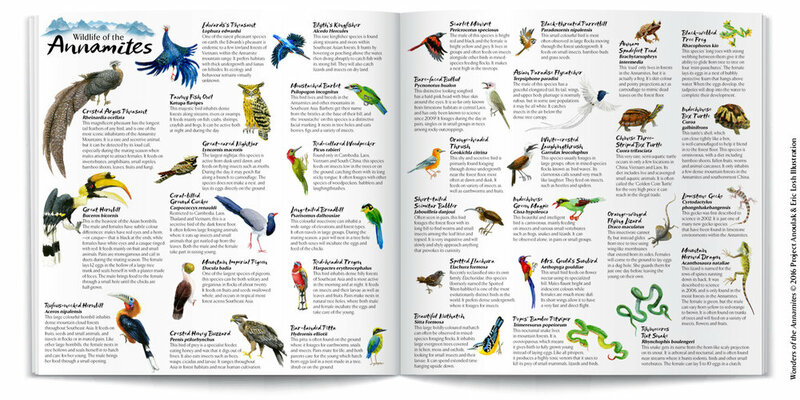 This is the first children's book to focus exclusively on the animal wonders of this region. "Wonders of the Annamites" features rare animals such the Saola, White-cheeked Gibbon, Crested Argus and Red-shanked Douc. The book is brought to you by Project Anoulak, a conservation organization working to protect the wildlife in the heart of the Annamites within the Nakai Nam Theun National Protected Area of Laos. Written and illustrated by Eric Losh, (creator of The Chorus of Kibale), this colorful and educational picture book aims to excite, educate and instill wonder for one of the wildest regions of our planet. An english hardcover edition of "Wonders of the Annamites" is for sale here. Editions in English/Lao and French/English have been printed by Project Anoulak, and an English/Vietnamese edition was published by Nha Nam Publishing in 2017.